If you love travel, there’s nothing quite like the thrill of boarding a plane bound for some far-flung destination, eagerly anticipating what you’ll experience when you reach your terminus. But if you're heading somewhere really far (we're talking Australia, New Zealand or Southeast Asia far) there’s the small matter of a long-haul flight to get through first. And, while I adore all things exploration, I wish I could do it without the flying part. Don’t get me wrong, I’m not scared of flying and I’m actually one of those unusual people who like plane food. I even get excited at the prospect of watching three movies and an entire TV boxset in one sitting. All that is fine. It’s the sleep part that gets me, or rather, eludes me, regardless of how much of a contortionist I become. Where you sit may not seem that important, after all, the seats are all the same size… right? While that’s largely true, there are ways to maximise your space. 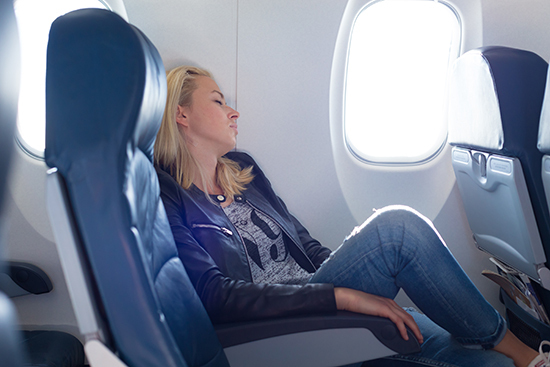 Opt for an exit row seat for example, and take advantage of the extra legroom. Even if you’re not too fussed about the view, always opt for a window seat too. You’ll not only have more space (that gap between your seat and the window itself is ripe for leaning into) but you also won’t be disturbed by fellow passengers who want to get in and out to go to the toilet. Instead, you can be the one who does the disturbing. Noise-cancelling headgear is pricey, we know, but if you’re a frequent flyer they’re a real investment. 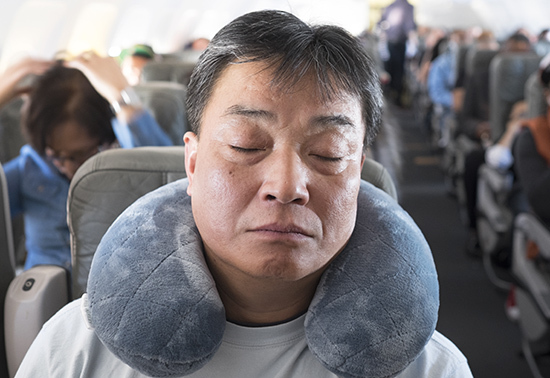 You can block out all that engine noise, the perpetual ding of the fasten seatbelt sign and that screaming child/snoring passenger/smooching couple (delete as applicable) in the row behind you. Pair them with an eye-mask and you're onto a winner. A decent neck pillow is invaluable. I personally use one of the memory foam variety, but if cabin baggage space is an issue you can always bring an inflatable one or a more squishable bean-filled pillow. It’ll stop your head from lolling all over the place, and make upright sleeping a much more pleasant affair. Tracksuit bottoms, hoodie, thick socks, toothbrush, toothpaste – all necessary for getting into that ‘getting ready for bed, feeling warm and cosy’ mind-set. If you’re worried about what you’ll look like (or are hoping for a free upgrade! ), board the plane in your smartwear, and get changed into your casuals as soon as the captain switches off the fasten seatbelt sign. Calming chamomile, lavender and peppermint have been known to naturally encourage sleep. Try taking some teabags infused with these flavours onboard and, when you start to feel sleepy, just ask the steward for a cup and hot water. The warmth, taste and aroma of the drink may be enough to send you into a peaceful slumber. If you get serious plane anxiety and need something a little stronger than herbal remedies, speak to your GP before you fly. 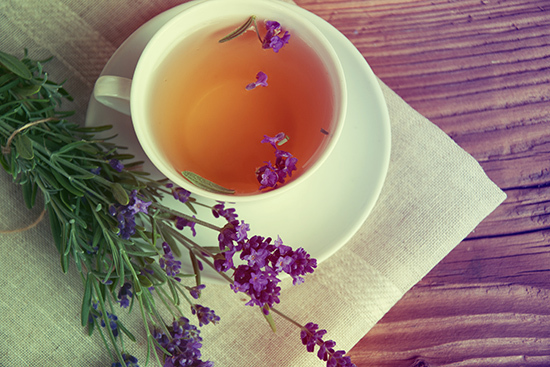 Why not try a soothing lavender tea in-flight? This is probably the most important tip. We can be our own worst enemies when it comes to getting some shut-eye – especially when you’re on a countdown. The more you stress about it, the more stressed and tense your body becomes, making sleep a rather elusive mistress. The best thing you can do is not to worry; don’t try too hard to sleep, let it happen naturally. Resign yourself to the fact that you might not sleep, and coming to terms with that fact may relax you enough that you eventually do drift off. There’s no point panicking if you don’t though: worst case scenario you’re a bit tired when you arrive. Need more travel advice? Speak to one of our Travel Experts about planning your trip and choosing the right flight and airline to suit you.